The holiday season is a festive season filled with family joy, right? There are holiday decorations, holiday songs, gifts and so much food. 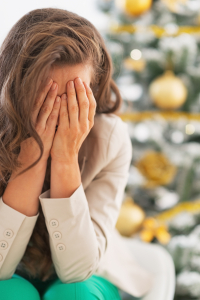 With everyone referring to “the most wonderful time of the year,” how can you not feel pressure to be joyous when you experience grief during the holidays? Well, there may come a Holiday season that could be the first time without one of our loved ones. Our first holiday season alone, as a widow, divorced or after the loss of a parent or other loved family member. Even if we are surrounded by other people we love, the first holiday season after a death or divorce signals that this is not a Holiday Season as usual. For many, no matter how hefty the egg nog, there’s a dose of dread lurking under their cheer – and rightfully so. Why Do the Holidays Make Us Lonely? Over the years we establish family traditions that remind us of the connection we have to our loves ones. Something as simple as a loved one who always gives us the worst gift may establish an expectation, or routine, that constitutes a tradition. These traditions may seem painful and hollow if we can’t share them anymore with our loved one. Instead, despite what we’re feeling, we get holiday cards in the mail beckoning us to “have the best Christmas Ever” or “to have a Joyous Season” and we are struck with the contrast between what we feel and what the rest of the world feels. We want to join in the joy the rest of the world is expressing and we may try to get sucked into the activity of the season and pretend the pain away, or we may withdraw from all of it and get engulfed in our sadness. If this is your first holiday after a loss, you may not know how you are going to manage the waves of grief that will hit you. Release the expectations about what the holidays should be. Just because there is a cultural imperative that there should be a whirlwind of merriment and joy, it is “ok” to simplify. Do only the things that comfort you. Do what you feel capable of, and do not push yourself outside your personal boundaries. Allow yourself to adapt traditions. Your loved one may have been an integral part of the traditions. Because your loved one isn’t present does not mean that the traditions have to be fully discontinued. See how family traditions can remain and honor the memory of the loved one – like a special meal everyone loved. Don’t pull away from the grief and from the memories. Let the tears and emotions engulf you when they come. But be open to the joys of the memories as well. Let yourself truly feel everything, good and bad. Choose to honor your loved one in your gifting. You may want to give a gift to an organization in the name of your loved one, such as supporting a family, or donating to a clothing or food bank. Remember the spirit of this donation as you prepare your belongings for transport; it is a good, positive thing to provide them to a family in need. Fill your house with live plants and greenery in order to remind yourself of the continuing of life. You may also ask to babysit children while a neighbor does their shopping, or spend time with a pet or volunteering at a shelter. Life is a cycle and it will continue, even for you, despite your sadness. If spirituality is part of your life, allow yourself to connect with that bigger part of yourself. Allow the meaning of the season to infuse you and sustain you in your grief. While it is natural for many of us to be angry in our grief, it may also provide you comfort. Be prepared for the holiday season, particularly if it is the first one after the loss of a loved one to be difficult. But know that as difficult as it is right now, slowly and gently you will reconnect with life. We buried my mother on Christmas Eve 1999. All good advice here today. Don’t pull away from the grief and from the memories. Let the tears and emotions engulf you when they come. But be open to the joys of the memories as well. Let yourself truly feel everything, good and bad. I think allowing yourself to grieve is so important – even during happy times. Thank you for this…so many people need these tips this time of year. Yes, firsts are tough but I love your suggestions especially filling the house with plants and other things that remind you of the continuation of life! Thank you Ines, for the wonderful advice! I’ve thankfully not lost anyone close and have yet to deal with this. But the year my stepdad died was difficult for my mom (she was an empty nester). So I organized for my family and several of my siblings to join in taking my mom to a nursing home and passing out colorful balloons and fruit to the seniors, all in my stepdad’s name, on Christmas Eve. It kept my mom from noticing the absence in our regular Christmas Eve affair… for the most part. Great tips here! Thank you. Although I’ve never experienced this I can see how it would be hard. Holidays have so many wonderful traditions and memories for me. Thanks for these important reminders and tips. Fortunately have not experienced this but am sensitive to others who might. Holidays can bring up painful feelings for those who are alone, life hasn’t gone the way they wanted, or do to loss. Excellent post. Excellent post. The holidays can be such a challenging time for so many people. While there are so many joyous things happening around us there are also many many people dealing with grief and loss. It is a beautiful yet sad time of year. While there are people who feel lucky during holidays, there are those who are saddened by unexpected circumstances. It is a reality! Pamela struggles with this at every holiday, and I think Mother’s Day is the worst for her. She keeps busy, and mostly celebrates with other people by helping them have joyous holidays. That seems to help her get through the days.